1. Cut the tomatoes into quarters, de peppers in thin strips and the cucumber in slices. Dice the feta cheese, chop the parsley and mix everything together. 2. 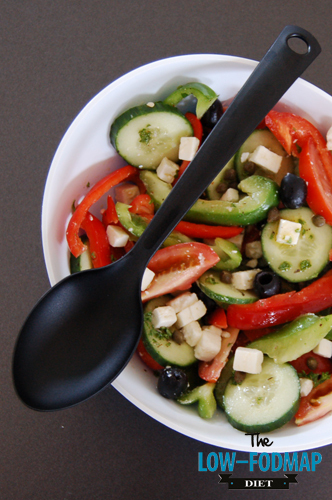 Divide the olives and capers over the salad and stir carefully. Divide the salad over the plates or serve in the salad bowl. 3. Make the dressing: mix the oil and vinegar until it’s a dressing. Chop the oregano and add it to the dressing. Season with some salt and pepper. Drizzle the dressing over the salad.